The United Arab Emirates consists of a federation of seven Emirates: Abu Dhabi (the capital), Dubai, Sharjah, Ajman, Umm-al-Qaiwain, Ras al-Khaimah and Fujairah. Dubai is the second largest Emirate with a total area of 4,114 sq.km. It lies on the northern coast of the Arabian Gulf extending to 72 kilometres making it the UAE’s most influential port and commercial centre. The city of Dubai is divided by a water creek that is 13 kilometres long and in places has a width of 500 metres. The government of Dubai is committed to a liberal, free market policy and to the creation of an environment conducive to business activity. Apart from being the business hub of the Gulf, Dubai has quickly become the world’s capital for luxury and shopping. Visitors come from all over the globe to see and enjoy Dubai’s incredible architecture, a man-made island and the tallest building on earth with its 163 floors – the 828 metre high Burj-Khalifa. Dubai is also a shopper’s paradise with the Dubai Mall, the largest shopping mall in the world hosting over 760,000 visitors every week. And there are many other large malls and other iconic developments around the city. Other statistics that surround Dubai and its phenomenal growth are staggering. Its estimated population has grown to 2,269,000, of whom 80% are expatriates. This figure is conservatively swollen by visitors, probably ten times that number during most months. Dubai International Airport handled over 70 million passengers in 2014, a 6% increase on the previous year. In rail transport, 2009 saw Dubai opening of the world’s longest driverless Metro network now carrying more than 500,000 passengers every day. Towards making UAE one of the safest and most secure countries in the world. We are committed to the implementation of the highest safety and excellence standards while executing firefighting, rescue and evacuation operations. The task of protecting and keeping the population safe from the risk of fire, together with all of the Emirates developments and investments lies in the hands of Dubai Civil Defence (DCD), who provide a round the clock 24/7 immediate response to fire and rescue calls and the need for evacuation from any threatening natural or man-made emergency. DCD also provides fire safety advice to business and commerce alike as well as to the public at large, and has specialist officers who work with developers, architects and builders dealing with fire prevention requirements in development projects to ensure that the appropriate fire detection systems, means of escape provision and firefighting measures meet international fire standards and codes. This is a significant responsibility; Dubai has 150 skyscrapers or tall towers, the third highest number in the world after New York and Hong Kong. 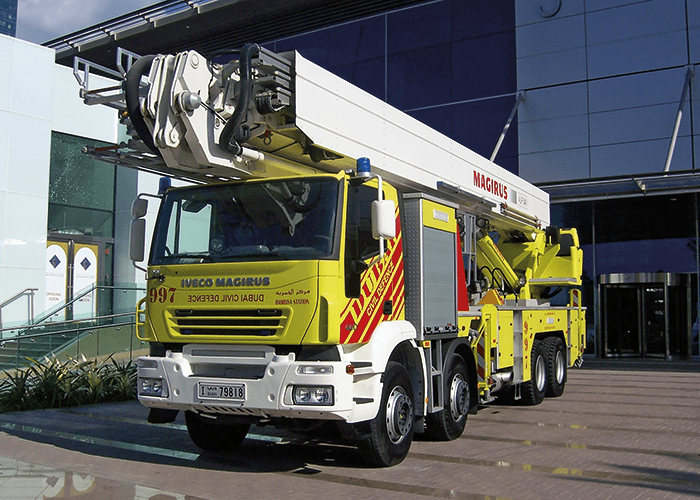 A Dubai Civil Defence 54 metre 8 x 4 Iveco Magirus Aerial Ladder Platform. The Director General of Dubai Civil Defence is Major General Expert Rashid Thani Al Matrooshi, FIFireE, who along with his principal officer team are based in Headquarters at Al Qusais from where they direct the diverse operational and safety work of the personnel of DCD. In order to provide an immediate 24/7 turnout of fire and rescue crews across the city, Dubai at present has an establishment of some 1,600 uniformed firefighters who work on shift duties manning 16 fire stations across the city. They are supported by approximately 200 civilian administration staff. As Dubai steadily grows, more fire stations are planned. In order to be ready for any type of emergency, DCD maintains a large fleet of emergency vehicles that includes general purpose pumping appliances, aerial ladder platforms able to reach up to 55 metres, rescue and breathing apparatus tenders, water tankers, control units, hazardous material, water rescue and other specialist fast response units. DCD also has a Training Centre at Al Awir where a varied training programme from recruit training through to specialised courses and continuation training is delivered using some of the highly complex equipment and procedures deployed during firefighting and rescue operations. The Torch Tower Dubai fire on 21 February 2015, showing the spread of flame on the external faces of the tower. DCD is also at the forefront of smart technology and its developing use in many areas of work and delivery of its services. In addition to its 997 Control Centre, DCD maintains a call centre where all fire alarms in Dubai are constantly monitored around the clock. Also being commissioned is an integrated Command suite which will bring all other relevant civil agencies, police and the military together when a major protracted emergency occurs and close working liaison is needed to return the community to some normality. A recent example of the use of new technology in firefighting and rescue operations is the introduction of four aerial drone units. These “eyes on the sky” are deployed at an incident above and around the building or accident site to provide geographic intelligence and other valuable layout information via live video links. Such information is critical for the Incident Commander in bringing an emergency situation under control. 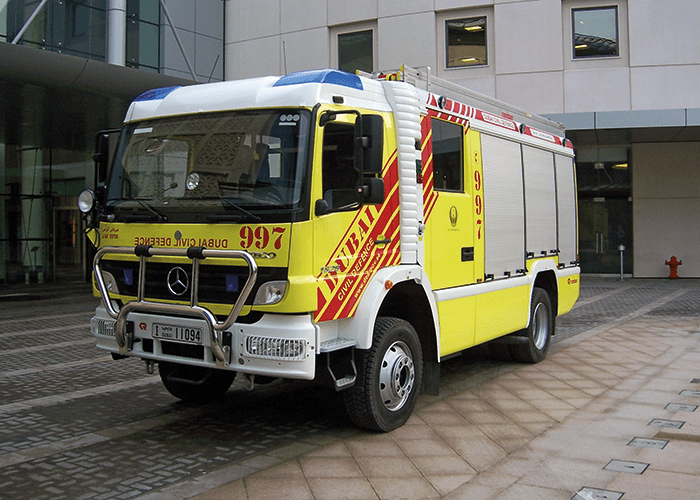 A Dubai Civil Defence Mercedes/Rosenbauer Firefighting and Rescue Pump. 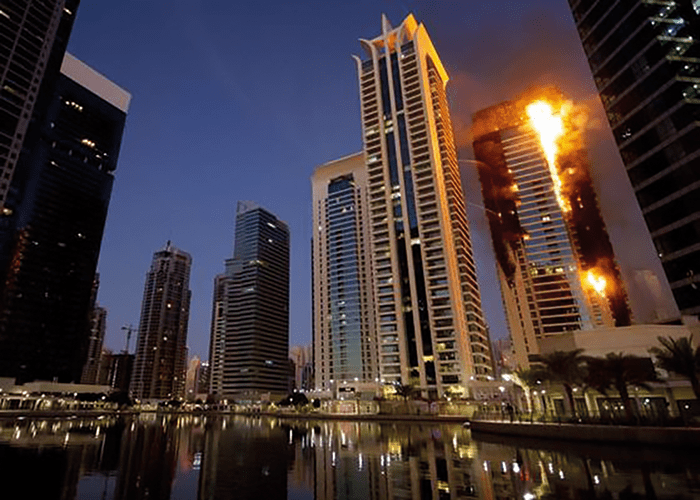 One particular recent major fire in Dubai that attracted the world’s media attention occurred in the 86 storey residential Marina Torch Tower on 21st February 2015. Completed in 2011, it is still one of the highest residential buildings in the world. In the early hours of the morning, fire broke out on a balcony on the 51st floor initially spreading fire upwards, and sending burning debris down into the street below. Even as DCD firefighters arrived very soon after the first alarm calls, some 1,750 residents were being evacuated. An evacuation drill had been carried out only two months before as required by Dubai law, with DCD firefighters and their fire vehicles present. The Fire Commander soon found his crews faced what he later described as a “three dimensional fire” as flames spread laterally around several corners of the tower, driven by a strong wind off the nearby seafront. But pre-planning and training paid off, as after several hours of hard physical firefighting at fire floor level and from above, the outbreak was finally brought under control without any serious casualties. A sprinkler system aided fire crews in restricting damage to a minimum. In the aftermath of the Marina Torch fire, DCD’s firefighters rightly gained worldwide admiration for how this highly difficult and challenging tower fire had been successfully extinguished. One major area of future planning for DCD is the World Expo event to be hosted in Dubai in 2020. The World Expo event is staged every five years and attracts millions of visitors who explore and discover pavilions, exhibits and cultural events staged by hundreds of participants including nations, international organisations and businesses. This is the first time this shop window of the world has been awarded to a Middle East country. Apart from the natural expansion of Dubai, planning for the huge increase in Dubai’s population over the six months during 2020 is a significant challenge for DCD, especially in the provision of additional fire cover and fire safety in the many places of public resort. In a clear recognition of the significant achievements over recent years of DCD’s highly motivated and professional teams under the leadership of Major General Matrooshi, in 2014, the Major General was awarded a Fellowship of the Institution of Fire Engineers (IFE). The IFE is an international fire association that during its near-100 year history has developed degree studies, technical, scientific and academic learning for fire officers worldwide. In so doing the IFE has assisted in spreading the fire safety message and effective firefighting strategies across many nations of the world. In noting the imminent arrival of the new Gulf Fire magazine, Major General Matrooshi welcomed the new publication in the hope that it would contribute to a vigilant application and understanding of fire safety and protection measures not just in the Gulf States, but also across the wider Middle East.